From the Department of Translational Biomarkers and Computational Genomics (S.W., S.P., R.G., S.K., J.T. ), Bristol-Myers Squibb, Hopewell Site, Pennington, NJ; Department of Genetically Defined Diseases Discovery Biology (L.J.B. ), Bristol-Myers Squibb, Wallingford, CT; Department of Innovative Clinical Development (I.Q., L.J. ), Bristol-Myers Squibb, Lawrenceville, Princeton, NJ; Department of Neurology (S.A.-D.), Northwestern Medical Faculty Foundation, Chicago, IL; Department of Neurology (R.F. ), Beth Israel Medical Center, Harvard School of Medicine, Boston, MA; Department of Neurology (D.M.S. ), Icahn School of Medicine at Mount Sinai Medical Center, New York, NY; Department of Neurology (A.G.S. ), University of Utah School of Medicine, Salt Lake City, UT; Department of Neurology (A.H.), Johns Hopkins University, Baltimore, MD. S.P. is currently affiliated with Biocon Bristol-Myers Squibb Research Center, Bangalore, India. Objective: To examine the incidence of nonsynonymous missense variants in SCN9A (NaV1.7), SCN10A (NaV1.8), and SCN11A (NaV1.9) in patients with painful and nonpainful peripheral neuropathy. Methods: Next-generation sequencing was performed on 457 patient DNA samples provided by the Peripheral Neuropathy Research Registry (PNRR). The patient diagnosis was as follows: 278 idiopathic peripheral neuropathy (67% painful and 33% nonpainful) and 179 diabetic distal polyneuropathy (77% painful and 23% nonpainful). Results: We identified 36 (SCN9A), 31 (SCN10A), and 15 (SCN11A) nonsynonymous missense variants, with 47.7% of patients carrying a low-frequency (minor allele frequency <5%) missense variant in at least 1 gene. The incidence of previously reported gain-of-function missense variants was low (≤3%), and these were detected in patients with and without pain. There were no significant differences in missense variant allele frequencies of any gene, or SCN9A haplotype frequencies, between PNRR patients with painful or nonpainful peripheral neuropathy. PNRR patient SCN9A and SCN11A missense variant allele frequencies were not significantly different from the Exome Variant Server, European American (EVS-EA) reference population. For SCN10A, there was a significant increase in the alternate allele frequency of the common variant p.V1073A and low-frequency variant pS509P in PNRR patients compared with EVS-EA and the 1000 Genomes European reference populations. Conclusions: These results suggest that identification of a genetically defined subpopulation for testing of NaV1.7 inhibitors in patients with peripheral neuropathy is unlikely and that additional factors, beyond expression of previously reported disease “mutations,” are more important for the development of painful neuropathy than previously discussed. The identification of patients carrying pathologic NaV missense variants provides an opportunity to select subjects whose pain may be more effectively treated with novel NaV agents. In this study, we collaborated with the Foundation for Peripheral Neuropathy to obtain DNA samples from patients with idiopathic or diabetic peripheral neuropathy enrolled in the Peripheral Neuropathy Research Registry (PNRR). The objective was to identify missense variants in SCN9A, SCN10A, and SCN11A and to examine their frequency in patients whose peripheral neuropathy was painful or nonpainful. The study was performed at Bristol-Myers Squibb using whole blood DNA samples obtained from patients enrolled in the PNRR from 2011 to February 2015. Clinical information and patient DNA samples were provided by the Neurology Departments at John Hopkins University, Northwestern Medical Faculty Foundation, Beth Israel Medical Center-Harvard Medical School, and Icahn School of Medicine at Mount Sinai Medical Center. Consenting patients were evaluated using a comprehensive patient examination form and patient health questionnaire and received peripheral nerve workup including nerve conduction studies and, in some cases, analysis of skin biopsies. A copy of the patient health questionnaire is provided in the supplemental information and included questions about sensory, motor, and autonomic symptoms and medication. Patients were instructed to answer pain-related questions from the perspective of their neuropathy only, and those with additional complex medical issues or neurologic diseases were excluded from the registry. A DNA sample for next-generation sequencing (NGS) was obtained from 457 patients; 278 patients diagnosed with idiopathic peripheral neuropathy (186 painful and 92 nonpainful) and 179 patients diagnosed with diabetic distal polyneuropathy (138 painful and 41 nonpainful). The PNRR patient sample comprised 61% of males and 83% of Caucasian ethnicity, and patients with painful peripheral neuropathy were significantly younger (by on average 6–7 years) than those without pain (table e-1 at Neurology.org/ng). At each consortium site, institutional review board approval was obtained based on a unified protocol developed as a consensus by the consortium members. Written informed consent was obtained from all patients presenting to the neurology clinics that agreed to enroll in the PNRR. Nav-targeted sequencing and variant calling. Variant classification and allele frequency comparisons. PNRR variants were designated as common (minor allele frequency [MAF] > 5%) or low frequency (MAF <5%) based on the alternate allele frequency reported in the NHLBI Exome Sequencing Project Exome Variant Server, European American (EVS-EA) population.15 To compare PNRR variant allele frequencies in patients with or without pain, or to reference populations (EVS-EA and 1000 Genomes Project16 global or European (EUR) populations), the Fisher exact test was performed using allele counts, and the Benjamini and Hochberg17 FDR was used to correct for multiple testing. All analyses were performed in R, and results were reported as the Fisher P and Q values. PNRR single nucleotide polymorphisms (SNPs) with MAF >10% were used for haplotype analysis. Genotypes were phased using BEAGLE V4.1.18 Haplotype block definition and frequency comparison were performed in Haploview.19 TAGGER within the Haploview package was used to find tag SNPs for each haplotype blocks to refine haplotype block definitions. A χ2 test was used to compare haplotype frequencies. Height, weight, and year of birth were analyzed by a 2-tailed t test to compare patients with diabetic or idiopathic peripheral neuropathy with pain vs without pain (GraphPad Prism v7). Statistical analysis methods for nonsynonymous variant and haplotype comparisons are described above. Incidence of genetic variants in the PNRR cohort. NGS of SCN9A, SCN10A, and SCN11A identified >1000 variants in each gene, with most (79%–87%) occurring in intronic regions (table e-2). Most of the protein-coding variants we identified were nonsynonymous, missense variants that changed the amino acid sequence (figure 1A). Details of the gene location and alternate allele frequency for each nonsynonymous missense variant we identified are reported in the supplementary section (figure e-1 and tables e-3 and e-4). Variants were designated as low frequency (MAF <5%) or common (MAF >5%) based on the alternate allele frequency reported in the EVS-EA database. A low-frequency missense variant in at least 1 gene was present in 47.7% (218/457) of patients with 9.8% carrying low-frequency variants in multiple genes (figure 1B). For individual genes, the number of patients carrying at least 1 low-frequency variant was 24.5%, 21%, and 13.6% for SCN9A, SCN10A, and SCN11A, respectively. 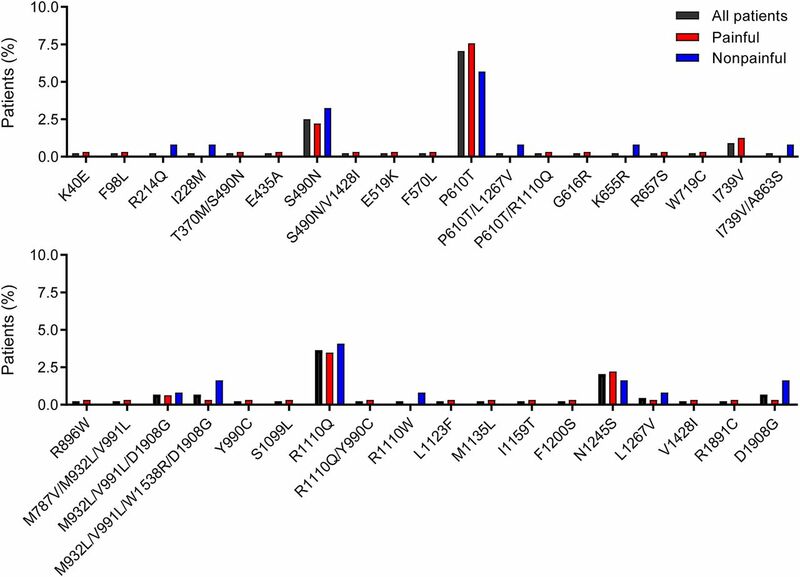 Patients were heterozygous carriers of low-frequency missense variants except for 5 subjects who were homozygous carriers of the SCN10A variants p.P1045T (n = 1), p.S509P (n = 2), or p.R14L (n = 1) or the SCN11A variant p.T1609I (n = 1). (A) Variants were classified based on changes in amino acid sequence. For each gene, results show the number (%) of variants identified in each class. (B) Number (%) of patients in the Peripheral Neuropathy Research Registry (PNRR) cohort (n = 457) that carry a low-frequency missense variant in NaV1.7, NaV1.8, and/or NaV1.9. Variants identified in PNRR patients were designated as low frequency (minor allele frequency <5%) based on the alternate allele frequency reported in the Exome Variant Server, European American reference population. For each gene, the analysis included all common and low-frequency nonsynonymous missense variants reported in PNRR patients, and the reference population being examined. The reference populations and the number of missense variants included in each analysis were as follows: EVS-EA: SCN9A (26), SCN10A (21), and SCN11A (10); 1000 Genomes (1K) global and EUR: SCN9A (23), SCN10A (21), and SCN11A (9). For SCN10A, an increase in the alternate allele frequency was observed for p.V1073A (odds ratio [OR] = 1.2519; 95% confidence limits [CLs] 1.0851–1.4443; p = 0.0021) and p.S509P (OR = 1.9225; 95% CL 1.3994–2.6411; p = 0.0001) compared with EVS-EA (table 1, table e-5). Similar results were also seen in comparison to the 1K-EUR population (p.V1073A: OR = 1.5783; 95% CL 1.3066–1.9064; p < 0.0001; p.S509P: OR = 2.0098; 95% CL 1.2432–3.2488; p = 0.0044) (table 1, table e-5). Several additional variants identified in SCN9A, SCN10A, and SCN11A had alternate allele frequencies that were significantly different from the 1K global population, but few remained significant compared with 1K-EUR, and none remained significant compared with the EVS-EA population (table 1, tables e-5, e-6, and e-7). The alternate allele frequencies in reference populations for previously reported GOF variants in SCN9A, SCN10A, and SCN11A are shown in tables e-3 and e-4 and were not significantly different in PNRR patients compared with the EVS-EA population. Relationship to pain status in PNRR patients. We next focused on examining the incidence of nonsynonymous missense variants in PNRR patients with painful or nonpainful peripheral neuropathy. Evaluation of clinical information identified a small number of subjects (17/457; 3.7%) with discrepancies between patient self-reported and physician-reported pain which were excluded from further analysis. The resulting distribution of patients was as follows: 270 idiopathic (183 painful and 87 nonpainful) and 170 diabetic (134 painful and 36 nonpainful). For all missense variants identified in each gene, analysis of allele frequency showed no significant difference between patients with or without pain (tables e-8, e-9, and e-10). We also saw no significant difference in the number of missense variants carried in each gene or all 3 genes combined in patients with or without pain (figure e-2). 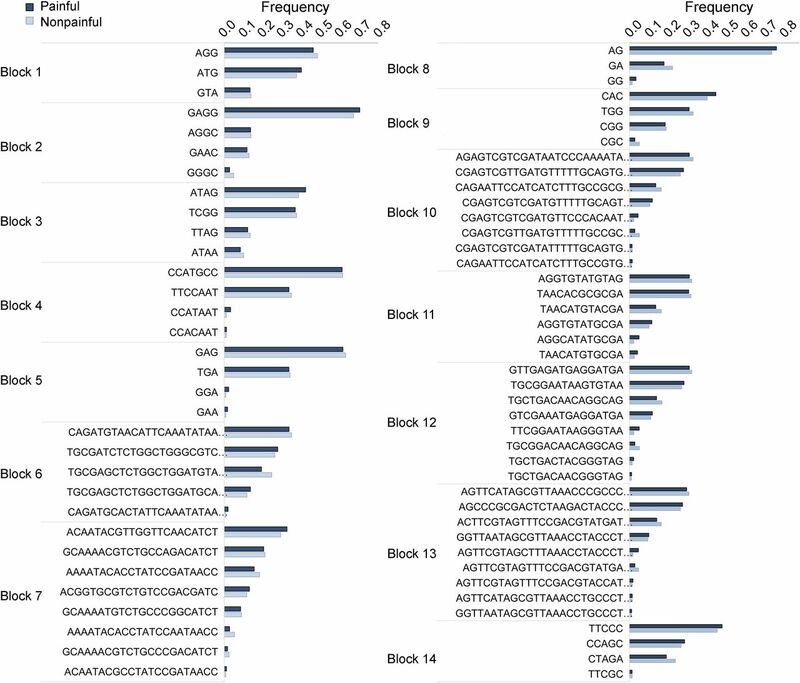 Consistent with results for the complete PNRR cohort, the number of patients carrying at least 1 low-frequency missense variant in SCN9A, SCN10A, or SCN11A was 25%, 21%, and 13%, respectively, with most of the individual variants or variant combinations present in only 1 patient (tables e-11, e-12, and e-13). For low-frequency variants present in >2% of patients, the incidence was similar in painful and nonpainful conditions (figure 2, figures e-3 and e-4) and in patients with diabetic and idiopathic peripheral neuropathy (figures e-4, e-5, and e-6). Finally, we selected a subset of patients with idiopathic peripheral neuropathy with probable, painful SFN using 2 approaches: (1) patients with idiopathic peripheral neuropathy with pain, autonomic symptoms but without weakness based on the patient history questionnaire (71 subjects) and (2) patients with idiopathic peripheral neuropathy with pain, normal nerve conduction velocity (NCV) but with abnormal skin biopsies with length-dependent patterns (19 subjects). The incidence of low-frequency missense variants in these groups was similar to the complete PNRR cohort (SCN9A 20%–26%, SCN10A 20%–21%, and SCN11A 14%–21%; table e-14). Results show the % of all patients, % of patients with painful peripheral neuropathy, or % of patients with nonpainful peripheral neuropathy that carry each individual SCN9A low-frequency missense variant or variant combination identified. Incidence of previously reported low-frequency missense variants. For SCN9A, 30/457 patients (6.6%) carried a low-frequency missense variant previously reported in patients with painful SFN,5,6 painful diabetic peripheral neuropathy,20 or (primary) IEM21,22 of which 14 (3.1%) carried GOF variant(s) based on cell-based electrophysiology results (p.I228M,23 p.G616R,21 p.I739V,24,25 and p.M932L/p.V991L5/p.W1538R22; table e-15). For SCN10A and SCN11A, previously reported variants6,–,8 were detected in 4 or 2 patients, respectively, with only 2 (0.4%) or 1 (0.2%) patient(s) carrying a known GOF variant (p.G1662S26 (SCN10A) or p.L1158P8 (SCN11A); table e-15). Although the incidence was low, collectively, these variants were detected in both patients with idiopathic and diabetic peripheral neuropathy and in both painful and nonpainful conditions (table e-15). SCN9A haplotypes in PNRR patients. To determine whether specific haplotypes are enriched in PNRR patients with painful vs nonpainful peripheral neuropathy, we performed haplotype analysis and compared haplotype frequencies between both groups. Specifically, 196 common SCN9A SNPs (MAF >10%) sequenced within the PNRR patient population were selected and phased using BEAGLE V4.1.18 One hundred eighty-five SNPs passed the Hardy-Weinberg (HWE) filter and were used to define 14 haplotype blocks in PNRR patients, with the majority consisting of 2 most frequently observed haplotypes (see Methods). No significant differences in haplotype frequencies were seen between patients with painful or nonpainful peripheral neuropathy (figure 3). Because haplotype block definitions are altered by the number of SNPs and may affect frequency estimates, we also used TAGGER to find tag SNPs and redefine haplotype blocks. 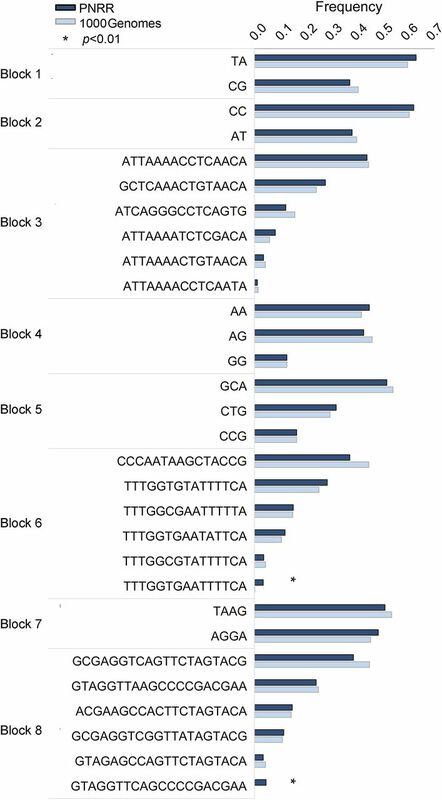 TAGGER identified 30 tag SNPs that were used to define 7 haplotype blocks. Again, we observed no significant differences in haplotypes between patients with painful or nonpainful peripheral neuropathy (figure e-7). Finally, we examined whether specific haplotypes were enriched in the PNRR cohort compared with the 1000 Genomes, Utah residents with Northern and Western European ancestry (1K-CEU) population. This reference population was selected because of the similarity in genetic background to the PNRR patient sample and because it provides a greater number of intronic and exonic SNPs for analysis than the EVS-EA population for which only exome sequencing data are available. Phased genotypes for 180 of the 186 PNRR SNPs were obtained from the 1K-CEU population data set of which 69 passed HWE filtering and were used to define 8 haplotype blocks. In comparison to the 1K-CEU reference population, there were 2 minor haplotypes that had increased frequencies in the PNRR patient population (p < 0.01; figure 4); however, they were present in less than 5% of the individuals, suggesting that these haplotypes may be functionally inconsequential. Results show the frequency of individual haplotypes, within 14 different haplotype blocks, in Peripheral Neuropathy Research Registry patients with painful or nonpainful peripheral neuropathy. Results show the frequency of individual haplotypes, within 8 different haplotype blocks, in Peripheral Neuropathy Research Registry (PNRR) patients or the 1000 Genomes CEU population. Results were analyzed by the chi-square test, *p < 0.01. In a cohort of 457 patients diagnosed with peripheral neuropathy, low-frequency missense variants in SCN9A, SCN10A, and/or SCN11A were common, with almost 50% of subjects carrying a variant in at least 1 gene. While the likelihood of carrying a low-frequency variant was high, most (∼75%) of the individual variant/variant combinations we identified were present in only 1 patient. Furthermore, for each gene, missense variant allele frequencies were not significantly different in patients whose peripheral neuropathy was painful or nonpainful. Finally, SCN9A haplotype analysis showed no significant differences in haplotype frequencies based on pain status, indicating no enrichment of specific haplotypes in patients with painful peripheral neuropathy. Human genetics provides compelling evidence that NaV1.7 plays a critical role in pain. Furthermore, identification of NaV1.9 mutations in rare genetic pain disorders27,–,29 and GOF missense variants in NaV1.7, NaV1.8, and NaV1.9 in patients with painful SFN5,–,8 suggest that each NaV channel subtype has the potential to contribute toward the pain experienced by patients harboring mutations. To date, the only study reporting sequencing results for all 3 genes in the same patient cohort showed that missense variants in SCN9A, SCN10A, or SCN11A were detected in 8.7%, 3.8%, and 2.8% of patients with painful, predominantly pure SFN, respectively.8 In comparison, the incidence of low-frequency missense variants in PNRR patients was ∼ 3–5-fold higher, and 10% carried variants in more than 1 gene. It is possible that differences in sequencing platforms, sequencing depth, and approaches to variant calling/identification may explain these results. Of interest, we detected SCN9A low-frequency variants in 26% of PNRR patients with probable painful idiopathic SFN based on symptoms, NCV, and abnormal skin biopsies, a result similar to the incidence reported in patients meeting strict clinical criteria for idiopathic pure SFN (29%).5 However, the incidence in our subset of PNRR patients was not different from the complete idiopathic group (24%), patients with diabetes (26%), or patients with painful (25%) or nonpainful (24%) peripheral neuropathy regardless of etiology, suggesting that SCN9A missense variants do not occur more frequently in patients with idiopathic SFN. With respect to the individual missense variants identified in PNRR patients, many were known SNPs, but several novel variants were also detected, most notably in SCN11A (27% novel variants). Of particular interest was the identification of patients carrying known GOF variants previously reported in patients with SFN or patients with IEM. Collectively, the incidence of carrying a known GOF missense variant in the PNRR cohort was very low, and they were present in some patients with a nonpainful phenotype. These results contrast with those reported in a small group of patients with strictly defined idiopathic SFN where all 8 SCN9A missense variants identified conferred GOF effects in cell-based electrophysiology assays.5 Thus, while the likelihood of carrying a low-frequency SCN9A missense variant was similar (see above), previous results suggest an enrichment of GOF variants in patients with idiopathic SFN, which was not apparent in PNRR peripheral neuropathy patients. It should be acknowledged that very few PNRR patients met criteria for probable idiopathic, pure SFN and that the biological impact of most of the missense variants we identified is unknown. Further investigation of patients with strictly defined pure idiopathic SFN is therefore important, given the potential attractiveness of this clinical population for testing of novel NaV1.7 agents. To compare missense variant allele frequencies in PNRR patients with reference populations, we selected the EVS-EA population for our primary analysis.15 The EVS database contains allele frequency information for exome sequencing variants identified in 4,300 Americans of European decent, a population closest in ancestry to the PNRR cohort.15 While no differences were noted for SCN9A or SCN11A, a significant increase in the alternate allele frequency of the SCN10A variants p.V1073A and p.S509P was seen in PNRR patients. While the impact of p.S509P is unknown, the p.V1073A common variant has a GOF effect, and expression of the A1073 protein produces larger peak currents, slower fast inactivation, and larger persistent currents compared with V1073 in cell-based electrophysiology assays.30,31 Of interest, genetic association studies also report that rs6795970 (p.V1073A) is strongly associated with prolongation of the PR interval and QRS complex of the electrocardiogram,32 atrial fibrillation,31 and Brugada syndrome.30 It should be noted that the EVS-EA population represents a mixture of phenotypes including controls, specific cardiac and lung diseases, and specific traits (low-density lipoprotein and blood pressure). However, p.V1073A and p.S509P alternate allele frequencies were also higher in PNRR patients compared with the 1000 Genomes EUR population comprising 503 self-reported healthy individuals. These results suggest an association of p.V1073A and p.S509P with the peripheral neuropathy phenotype, although there was no association with pain status within the PNRR patient group itself. Previous studies have also reported an association of the SCN9A missense variants p.D1908G and p.V991L/p.M932L with neuropathic pain in patients with painful diabetic peripheral neuropathy.20 We also detected these variants in PNRR patients; however, we did not see any difference in allele frequencies compared with the EVS-EA reference population. It should be noted that patients with diabetic painful distal polyneuropathy comprised only 30% of the PNRR population, while the previous study focused on patients with diabetes enrolled in clinical trials with strict inclusion criteria including pain intensity scores. In addition, the reference population selected was important; we consider EVS-EA to be the most appropriate comparator; however, a significant difference in the alternate allele frequency was observed when compared with the 1K-EUR population. Finally, with respect to the 1K global population, we consider the marked heterogeneity in MAF across the different ethnic groups comprising this population to be the likely explanation for both the increased number of variants and discrepancies in the direction of the frequency change observed when compared with results from the EVS-EA analysis. Results from this study showed marked allelic heterogeneity in SCN9A, SCN10A, and SCN11A in patients with idiopathic or diabetic distal polyneuropathy. While NaV1.7 inhibitors have the potential for the treatment of peripheral neuropathic pain, identification of a specific, genetically defined subpopulation for drug testing in patients with peripheral neuropathy appears unrealistic. Additional factors, beyond expression of an NaV channel missense variant, appear to be important because there was no relationship between the presence of missense variants and pain state in PNRR patients. This approach may have utility for the exploration of other disease-related genes and the identification of druggable molecular targets in patients with neuropathic pain. Dr. Wadhawan: drafting of the manuscript and analysis and interpretation of data. Dr. Pant: drafting of the manuscript, study design, and analysis and interpretation of data. Dr. Golhar: analysis and interpretation of data. Dr. Kirov: drafting of the manuscript and analysis and interpretation of data. Dr. Thompson: drafting of the manuscript, study design, and analysis and interpretation of data. Dr. Jacobsen: study concept and design. Dr. Qureshi: analysis and interpretation of data. Dr. Ajroud-Driss, Dr. Freeman, Dr. Simpson, Dr. Smith, and Dr. Hoke: drafting of the manuscript, study concept, and interpretation of data. Dr. Bristow: drafting of the manuscript, study concept and design, and analysis and interpretation of data. Bristol-Myers Squibb provided all funding to support patient DNA sequencing, data acquisition, data analysis, and preparation of the manuscript by company employees. Patient DNA samples were acquired from subjects enrolled in the Peripheral Neuropathy Research Registry (PNRR) established by the Foundation for Peripheral Neuropathy (FPN). Funding for the development and maintenance of the PNRR was provided by the FPN. Major funding for patient enrollment at the consortium sites and ongoing maintenance of the database and repository at Indiana University came from the following sources from January 1, 2014, through December 31, 2016: Bristol-Myers Squibb, INSYS Development Company, the Jack Miller Family Foundation, the Daniel F. and Ada L. Rice Foundation, and Jack and Goldie Wolfe Miller. S. Wadhawan, S. Pant, R. Golhar, and S. Kirov have been employees of Bristol-Myers Squibb. J. Thompson has been an employee of, has received research support from, and owns stock/stock options in Bristol-Myers Squibb. L. Jacobsen and I. Qureshi have been employees of and own stock/stock options in Bristol-Myers Squibb. S. Ajroud-Driss has served on the scientific advisory boards of MT Pharma and Alnylam; receives publishing royalties from UpToDate; has served on the speaker's bureau of MT Pharma; and has received research support from Alnylam Viromed and the Foundation for Peripheral Neuropathy. R. Freeman has served on the scientific advisory boards of Abide, Acetylon, Astellas, Biogen, Daiichi Sankyo, Dong, Grace, Grunenthal, Insys, Lundbeck, Nestle, Novartis, Pfizer, Vertex, and Spinifex; has served on the editorial boards of Autonomic Neuroscience, Clinical Autonomic Research, and the Clinical Journal of Pain; receives publishing royalties from UpToDate; has received research support from Impeto, Nestle, Pfizer, the NIH, and Multiple System Atrophy Consortium; and owns stock/stock options in Spinifex. D.M. Simpson has served on the scientific advisory boards of Allergan, Merz, Ipsen, and DSMB: Axsome; has received speaker honoraria from Allergan, Merz, and Ipsen; has served on the editorial board of AIDS Patient Care; has received publishing royalties from Oxford University Press; has been an employee of the Icahn School of Medicine at Mount Sinai; has been a consultant for, has served on the speakers' bureaus of, and has received research support from Allergan, Merz, Ipsen; has received research support the NINDS and the Foundation for Peripheral Neuropathy; and has been involved in legal proceedings regarding Proctor and Gamble. A.G. Smith has served on the scientific advisory board of the Celgene Data Monitoring Committee; has served on the editorial board of NeuroLearn; has been a consultant of Regenesis, Allergan, and Viromed; and has received research support from Impeto Medical SAS and the NIH. A. Hoke has served on the editorial board of Experimental Neurology and Annals of Clinical Translational Neurology; has been an employee of Johns Hopkins University; has been a consultant of Neurocrine Inc.; has received research support from the NIH, the Foundation for Peripheral Neuropathy, and the Dr. Miriam and Sheldon G. Adelson Medical Research Foundation; and was involved in the following legal proceedings: National Vaccine Injury Program—gave expert testimony on GBS and Arnold & Porter Kaye Scholer LLP—gave expert testimony on peripheral neuropathy. L.J. Bristow has been an employee of, has received research support from, and owns stock/stock options in Bristol-Myers Squibb. Go to Neurology.org/ng for full disclosure forms. The authors thank the patients, their families, consortium members, and the Foundation of Peripheral Neuropathy for their support of the PNRR. They also thank the NHLBI GO Exome Sequencing Project and its ongoing studies, which produced and provided exome variant calls for comparison: the Lung Go Sequencing Project (HL-102923), the WHI Sequencing Project (HL-102924), the Broad Go Sequencing Project (HL-102925), the Seattle Go Sequencing Project (HL-102926), and the Heart Go Sequencing Project (HL-103010). Funding information and disclosures are provided at the end of the article. Go to Neurology.org/ng for full disclosure forms. The Article Processing Charge was funded by the Bristol-Myers Squibb. Accepted in final form October 2, 2017.
. NaV1.7 as a pain target—from gene to pharmacology. Pharmacol Ther 2017;172:73–100.
. The Na(V)1.7 sodium channel: from molecule to man. Nat Rev Neurosci 2013;14:49–62.
. Primary erythromelalgia: a review. Orphanet J Rare Dis 2015;10:127.
. Novel sodium channel antagonists in the treatment of neuropathic pain. Expert Opin Investig Drugs 2016;25:215–226.
. Gain of function NaV1.7 mutations in idiopathic small fiber neuropathy. Ann Neurol 2012;71:26–39.
. Painful neuropathies: the emerging role of sodium channelopathies. J Peripher Nerv Syst 2014;19:53–65.
. Gain-of-function NaV1.8 mutations in painful neuropathy. Proc Natl Acad Sci USA 2012;109:19444–19449.
. Gain-of-function mutations in sodium channel Na(v)1.9 in painful neuropathy. Brain 2014;137:1627–1642.
. Painful peripheral neuropathy and sodium channel mutations. Neurosci Lett 2015;596:51–59.
. Aligning sequence reads, clone sequences and assembly contigs with BWA-MEM. 2013. arXiv:1303.3997v2 [q-bio.GN].
. A framework for variation discovery and genotyping using next-generation DNA sequencing data. Nat Genet 2011;43:491–498.
. From FastQ data to high-confidence variant calls: the Genome Analysis Toolkit best practices pipeline. Curr Protoc Bioinformatics 2013;43:1–33.
. Using Drosophila melanogaster as a model for genotoxic chemical mutational studies with a new program, SnpSift. Front Genet 2012;3:35. Exome Variant Server, NHLBI GO exome sequencing project (ESP). Seattle, WA. Available at: http://evs.gs.washington.edu/EVS/. Accessed March, 2017. 1000 Genomes Project Consortium, Auton A, Brooks LD, Durbin RM, et al. A global reference for human genetic variation. Nature 2015;526:68–74.
. Controlling the false discovery rate: a practical and powerful approach to multiple testing. J R Statist Soc B 1995;57:289–300.
. Rapid and accurate haplotype phasing and missing-data inference for whole genome association studies by use of localized haplotype clustering. Am J Hum Genet 2007;81:1084–1097.
. Haploview: analysis and visualization of LD and haplotype maps. Bioinformatics 2005;21:263–265.
. SCN9A variants may be implicated in neuropathic pain associated with diabetic peripheral neuropathy and pain severity. Clin J Pain 2015;31:976–982.
. Alternative splicing may contribute to time-dependent manifestation of inherited erythromelalgia. Brain 2010;133:1823–1835.
. Novel mutations mapping to the fourth sodium channel domain of NaV1.7 result in variable clinical manifestations of primary erythromelalgia. Neuromolecular Med 2013;15:265–278.
. Intra- and interfamily phenotypic diversity in pain syndromes associated with a gain-of-function variant of NaV1.7. Mol Pain 2011;7:92.
. Functional profiles of SCN9A variants in dorsal root ganglion neurons and superior cervical ganglion neurons correlate with autonomic symptoms in small fiber neuropathy. Brain 2012;135:2613–2628.
. NaV1.7-related small fiber neuropathy: impaired slow-inactivation and DRG neuron hyperexcitability. Neurology 2012;78:1635–1643.
. The G1662S NaV1.8 mutation in small fiber neuropathy: impaired inactivation underlying DRG neuron hyperexcitability. J Neurol Neurosurg Psychiatry 2014;85:499–505.
. The phenotype of congenital insensitivity to pain due to the NaV1.9 variant p.L811P. Eur J Hum Genet 2015;23:561–563.
. Gain-of-function mutations in SCN11A cause familial episodic pain. Am J Hum Genet 2013;93:957–966.
. A de novo gain-of-function mutation in SCN11A cause loss of pain perception. 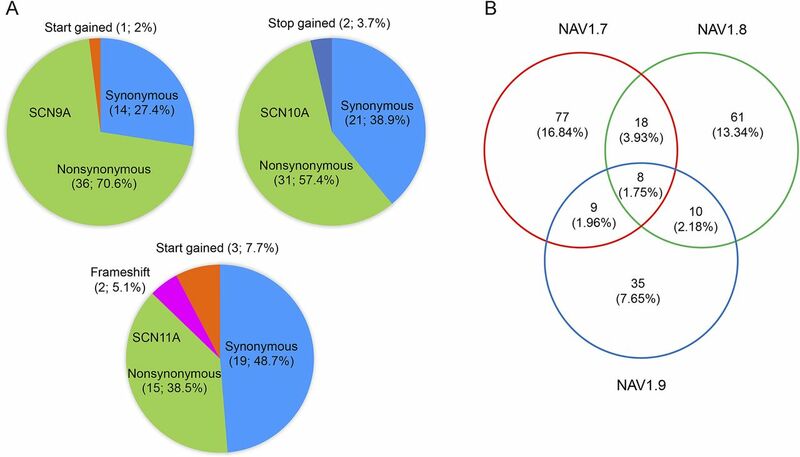 Nat Genet 2013;45:1399–1404.
. Role of common and rare variants in SCN10A: results from the Brugada syndrome QRS locus gene discovery collaborative study. Cardiovasc Res 2015;106:520–529.
. Common and rare variants in SCN10A modulate the risk of atrial fibrillation. Circ Cardiovasc Genet 2015;8:64–73.
. Several common variants modulate heart rate, PR interval and QRS duration. Nat Genet 2010;42:117–122.